› Author Affiliations Funding This work was supported by grants MOST-102–2320-B-003–001-MY3 (Chiang-Ting Chien), MOST-106–2314-B-002 -156 -MY2 (Po-Yuan Chang) from the Ministry of Science and Technology, and a research fund from Taipei City Hospital (Chih-Yao Chiang). Objective Activation of thromboxane A2 synthase (TXAS)/thromboxane A2 (TXA2)/thromboxane prostanoid (TP) receptor leads to arterial constriction, platelet aggregation and vascular injury. We attempted to characterize the microvascular dysfunction in ischaemia/reperfusion injury using genetically modified TXAS−/−, TP−/− and TXAS−/−TP−/− mice. Approach and Results The cardiac micro-circulation and electrocardiograms were evaluated from B6, TXAS−/−, TP−/− and TXAS−/−TP−/− mice in response to intravenous saline, endothelin-1, U46619 (a TXA2 agonist) and myocardial ischaemia/reperfusion injury. Cardiac function was investigated with myocardial permeability, the troponin I concentration and the infarct size. Myocardial TXAS, TP, endothelial nitric oxide (NO) synthase (eNOS), nicotinamide adenine dinucleotide phosphate oxidase 4 (NOx4), 4-hydroxynonenal, interleukin (IL)-1β, cell apoptosis, coronary effluent thromboxane B2 (TXB2) and superoxide anions (O2 −) and NO concentrations were measured. Mice mesenteric reactivity in response to various drugs was assessed by wire myography. In vivo fluorescent platelet adhesiveness to the mesenteric arterial endothelium after FeCl3 stimulation was examined. 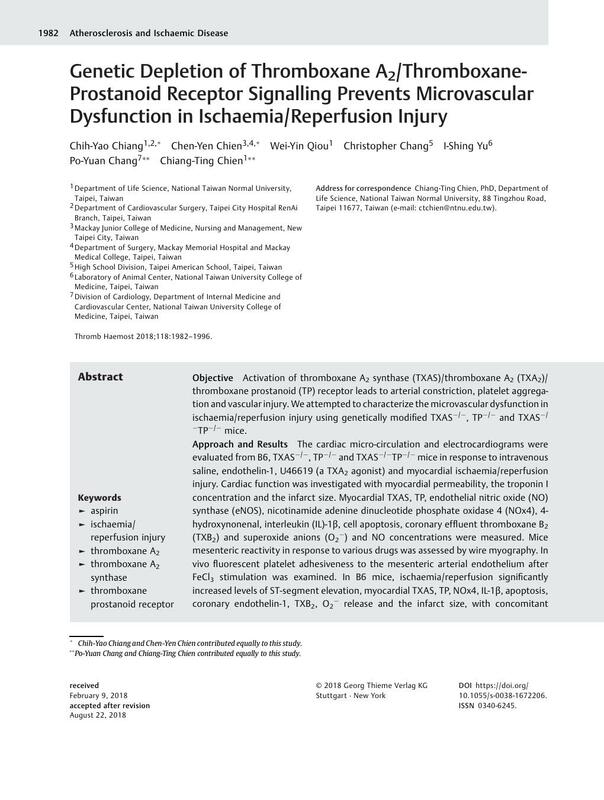 In B6 mice, ischaemia/reperfusion significantly increased levels of ST-segment elevation, myocardial TXAS, TP, NOx4, IL-1β, apoptosis, coronary endothelin-1, TXB2, O2 − release and the infarct size, with concomitant decreases in eNOS, NO concentrations and cardiac micro-circulation. These effects were remarkably depressed in TXAS−/−, TP−/− and TXAS−/−TP−/− mice. Aspirin treatment or depletion of the TXAS, TP or TXAS/TP gene significantly attenuated the exaggerated vascular reactivity by vasoconstrictors and vasodilators and efficiently reduced platelet adhesion to the mesenteric endothelium under FeCl3 stimulation. Conclusion Inhibiting TXAS/TXA2/TP signalling confers microvascular protection against oxidative injury in both cardiac and mesenteric arteries. * Chih-Yao Chiang and Chen-Yen Chien contributed equally to this study. ** Po-Yuan Chang and Chiang-Ting Chien contributed equally to this study.